This week we will pass the 90 day mark leading up to the ESIP Summer Meeting in Tacoma – a key milestone for those of you who may need to forecast your attendance. With a fantastic plenary lineup and a growing list of proposed breakout sessions, there are numerous reasons to register now for the meeting and submit your own session proposal by the deadline of 4/26. This summer's meeting will include a new feature – the Research Showcase, an evening event that will combine the ESIP Poster & Demo Session (traditionally held at ESIP Winter Meetings) with Research as Art (usually held at ESIP Summer Meetings). When you register for the meeting, you can indicate that you would like to contribute in any or all of the following ways: present a poster, demo something, and share artwork. We hope that you will be excited by the variety of ways you can communicate your research during this memorable evening. This week, we also want to remind you of the GeoSemantics Symposium and the Teacher Workshop taking place in conjunction with the ESIP Meeting. Read on to learn more. Finally, be sure to join us on Friday 4/19 at 1 pm ET for the next ‘Data in Action' Webinar: ESIP Collaboration Area Highlights. 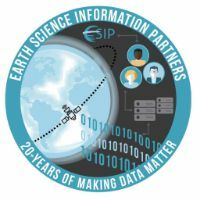 Find out what 12 of ESIP's Clusters and Committees are doing to increase the use and value of Earth science data and information. The GeoSemantics Symposium, hosted by ESIP's Semantic Technologies Committee, will take place on Monday, July 15th, the day before the ESIP Summer Meeting kicks off. This year's theme is Building Harmony between Data Semantics and Machine Learning. Register now to join us for the full week of action! The ESIP Education Committee is looking for science and technology teachers from middle, high school, and community colleges to join the Data in Action Teacher Workshop to be held on Wednesday, July 17th at the ESIP Summer Meeting. Participants will learn how to put data in action in the classroom through the use of Jupyter Notebooks and other Earth science tools. Learn more and reserve your spot here. ESIP is home to 30+ community-driven collaboration areas (clusters, committees, & working groups) aimed at addressing diverse Earth science data challenges and opportunities. 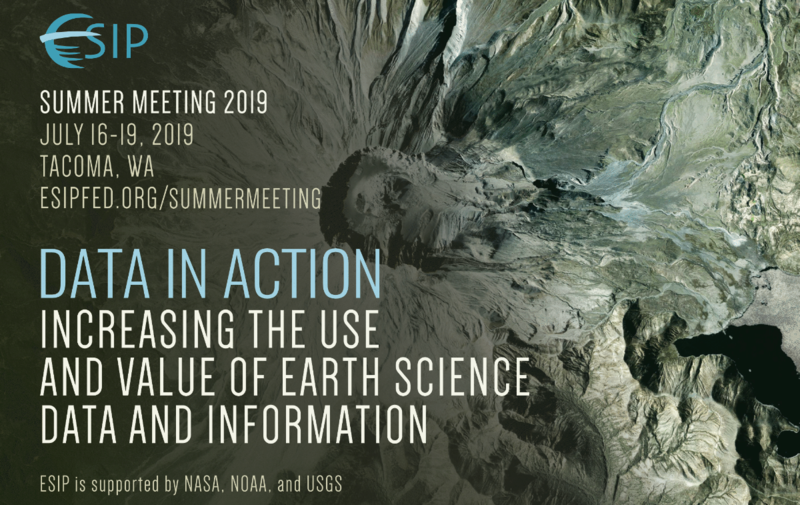 In the second webinar in the series ‘Data in Action: Increasing the Use and Value of Earth Science Data and Information,' ESIP collaboration area representatives will share lightning presentations about their goals and activities in line with the webinar series theme. Webinar attendees can expect to gain a broader awareness of ongoing ESIP collaboration area efforts and to find out how to get involved. Participating collaboration areas include: Agriculture & Climate, Community Resilience, Data Stewardship, Disaster Lifecycle, CLEAN Network, Education, Envirosensing, Information Quality, Marine Data, Research Object Citation, Semantic Technologies, and Usability. The Spring 2019 Out2Lunch Webinar Series has concluded, but you can catch the whole series of 10 minute demos of Earth science tools and resources here. Thanks to the Education Committee for organizing another awesome series of webinars! According to OGC, the most important hackathon in OGC history will take place in London on June 20th and 21st, 2019. The event will test draft OpenAPI-based specifications for features, coverages, map tiles, and processes using a common Application Programming Interface (API) template. It will be instrumental to the evolution of OGC web standards to a modern API-based approach, setting the course for open geospatial standards – in and outside OGC – for the next decade. For more information, including venue information, registration requirements, and expected skill sets, visit the OGC API Hackathon event page or register on Eventbrite by 5/3.